Thirsty Pilgrim: We're All Waiting for the Malt. I'm sitting here in the lobby of the Hotel Tilawa on scenic Lake Arenal. There's a three-barrel brewing system here that needs some spit and polish, and a broom to knock out those spider webs, but otherwise it's ready to roll. The hops are in the cooler. So is the yeast. A brewer has joined the outfit and is trying to keep busy. All they need is the malt. At the moment there are about 5,000 pounds of the stuff sitting in Canada. It's several weeks late now. Through no fault of its own, customs officials have decided the malt's paperwork is not altogether complete. Which is not the same as explaining exactly what paperwork is required. Bureaucracy is fun. Two governments that make an art of it are Canada and Costa Rica. Anyway, I just wanted to say hello. There's a lot more to tell about Volcano Brew, and about another upstart on the Pacific Coast. That one is waiting on the malt too. 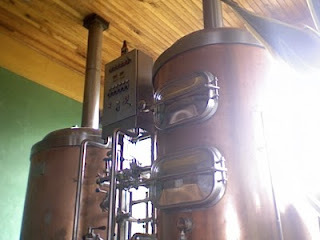 Until it shows up, there are exactly zero microbreweries in Costa Rica. Stay tuned. I think that the brewhouse is calling you.... bring your vast knowledge to the mash tun and let the education of Costa Rica begin!! !